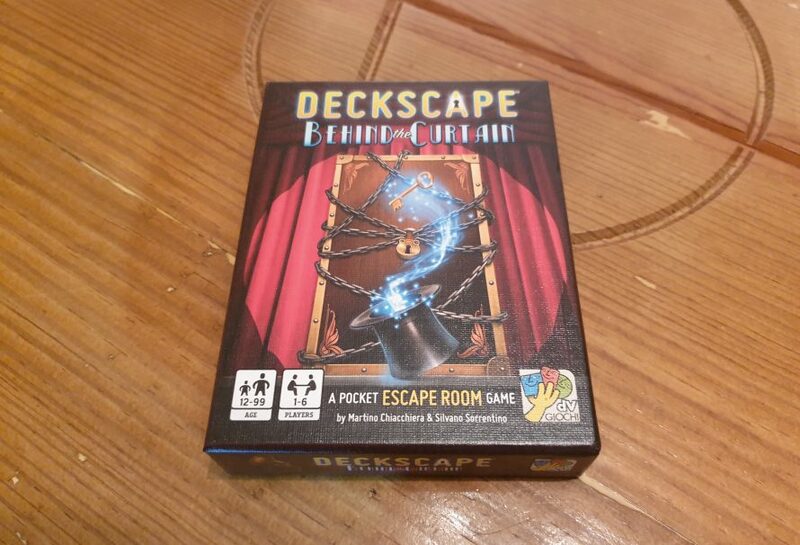 Deckscape: Behind the Curtain is the brand new escape room style adventure game from publisher dV Giochi. This is the fifth title in the series which pits players against a deck of cards which is full of puzzles. Designed by Martino Chiacchiera and Silvano Sorrentino, with art from Alberto Bontempi, Behind the Curtain is themed around a magic show. However, is this an hour long experience you’ll want to escape from? Let’s find out. Setting the scene are a handful of prologue cards for players to read, introducing people not only to this game but how the escape room mechanics work. As it does not add much past the text on the back of the box it isn’t really a spoiler, but skip this paragraph if you don’t want any information. 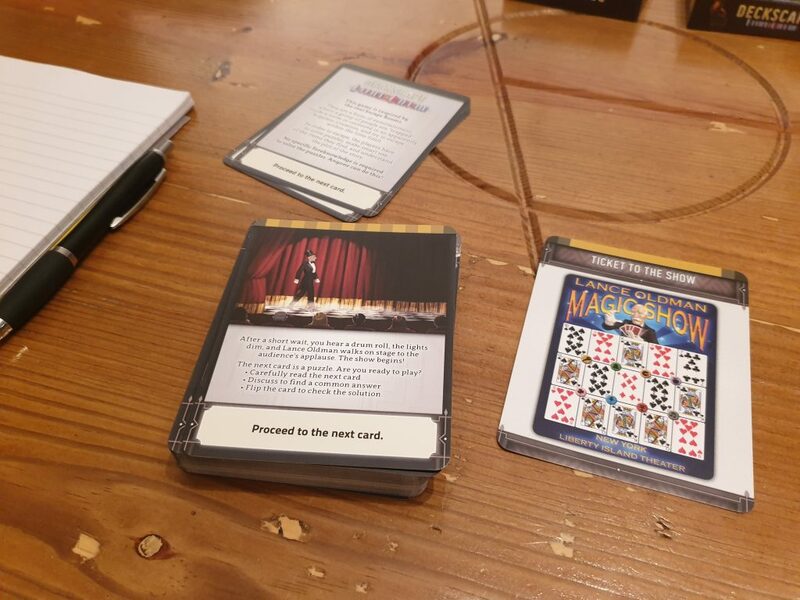 Players have been mysteriously invited to the final show of a famed magician Lance Oldman. Attending the show you sit back and relax, watching and guessing how tricks are done. Then, Oldman turns to the audience for a volunteer and your seat number is called… this is where the adventure and the timer truly starts. Deckscape is an app free escape room experience, meaning aside from using a phone as a timer, if a clock isn’t within sight, players can completely unplug. Everything included from the cards to the mystery envelope are used as players work through the deck. The key thing is to follow the instructions laid out at the beginning, flipping cards and opening the envelope only when instructed to do so. At the start of the game there are a couple of quick puzzles to solve before the scoresheet is unveiled. At this point, write down the time as you start the adventure. There are no turns in Deckscape Behind the Curtain. Players read aloud any cards they are told to look at and attempt to solve the puzzles. Puzzles come in a number of forms including: visual puzzles, logic based and item usage. As players work their way through the experience new items will become available to them, often required for future or already found puzzles. With multiple puzzles to solve at once, at multiple times in the adventure, this means some are occasionally not possible until an item has been located. This keeps players on their toes but can be a tad frustrating if an answer is correctly guessed but the item is not yet found. One way or another when players think they know the answer they will flip the card. If you have got the answer correct it will match the solution on the back of the card. Otherwise the players are able to read the explanation, often with the visual clues pointed out. Incorrect guesses result in an X mark on the scoresheet. This means that if players are truly stuck they can simply flip the card over to reveal the answer and take the X mark. Theoretically players could just flip their way through the deck building up countless X marks. This isn’t befitting of the game and would only ruin the experience for everyone involved. At the end of the adventure players will count up their real life time spent and add to it 5 minutes per X mark on their scoresheet. This will give a slightly different end text to read, indicating how well the adventure went. The unique aspect of Behind the Curtain is the mystery envelope. Without spoiling what it contains it sticks to the theme and is well utilized. In previous Deckscapes it was clear what the special item was, like the map in Eldorado. Until you open the mystery envelope this isn’t clear what will be in it, from feel or weight. 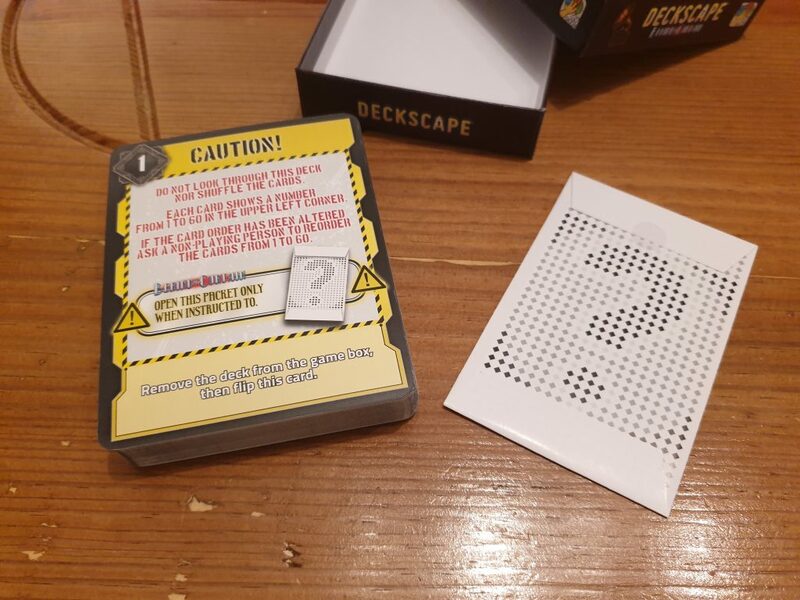 While the envelope packaging might show some wear and tear eventually, Behind the Curtain – like the rest of the Deckscape franchise – is resettable. While you won’t want to be playing through again, as you’ll know every puzzle that comes up, this does allow you to pass the game on to a friend or family member. The deck is helpfully numbered to be put in order, and sections of the deck are coloured differently. This is for organisation during play when instructed to split the deck but also helps when packing the experience away. While I was attached to the wonder of the Deckscape Mystery of Eldorado theme even before playing, Behind the Curtain certainly rivals it. There is something captivating about the magic show theme that works harmoniously through the deck of puzzles. There are a few special puzzles that provided some real wow moments, not that the rest aren’t enjoyable – with at least one of these as a result of the mystery envelope’s contents. Escape room games may not be a game to keep on the shelf but for the entertainment Behind the Curtain provides it is an experience to have and pass onto others!